DUBLIN, Ireland, 2018-Feb-27 — /Travel PR News/ — Ryanair, Europe’s No.1 airline, today (22 Feb) launched its Northern Ireland winter 2018 schedule, with 15 routes in total, including a new Belfast route to Manchester and the return of winter flights from Belfast to London, which will help deliver 1.1m customers p.a. through Ryanair’s 2 airports in Northern Ireland this year. Ryanair will continue to connect Northern Ireland with major business centres on high frequency, low fare services including Glasgow (5 wkly), London (3 daily), and Manchester (2 daily), with better timings and lower fares, making Ryanair the ideal choice for Northern Irish business and leisure customers and visitors. However, given the uncertainty surrounding Brexit in March 2019, Ryanair reiterated the need for clarity before it publishes its summer 2019 schedule in the second quarter of 2018. Ryanair warned it may be forced to cancel flights and move some, or all, of its UK based aircraft to Continental Europe from April 2019 onwards should the legal basis for the operation of flights between the UK and the EU by autumn 2018 remain undefined. 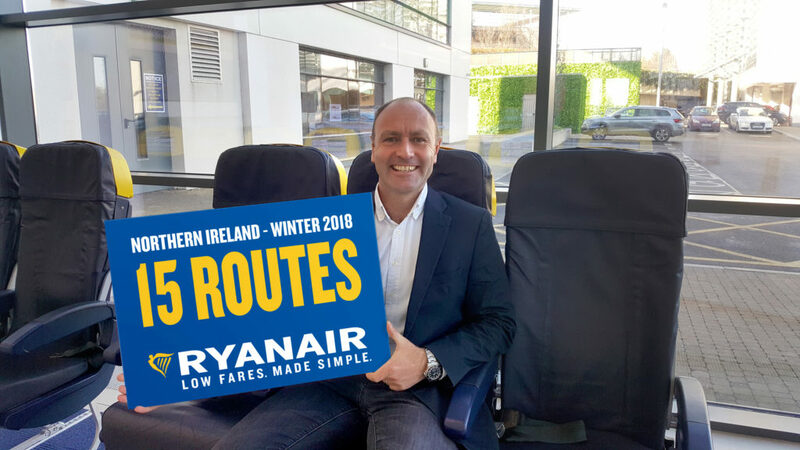 “We are pleased to launch our Northern Ireland winter 2018 schedule, which includes a new Belfast route to Manchester and the return of winter flights from Belfast to London, and 15 routes in total, which will deliver 1.1m customers through Northern Ireland’s airports this year. Northern Irish customers and visitors can book our Winter 2018 seats from next month, as fares continue to fall, so there’s never been a better time to book a low fare flight on Ryanair. We remain concerned at the uncertainty which surrounds the terms of the UK’s departure from the EU in March ’19. While we continue to campaign for the UK to remain in the EU Open Skies agreement, we caution that should the UK leave, there may not be sufficient time, or goodwill on both sides, to negotiate a timely replacement bilateral which could result in a disruption of flights between the UK and Europe for a period of time from April ’19 onwards, and/or the cancellation of flights and routes, and the movement of our based aircraft to Continental Europe. This entry was posted in Airlines, Airports, Flights, Travel, Travel Services, Travelers and tagged Kenny Jacobs, Northern Ireland winter 2018 schedule, Ryanair. Bookmark the permalink.